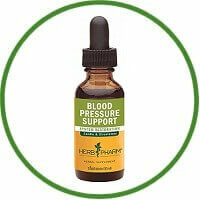 Help maintain established, normal blood pressure with blood pressure support herbal formula from Herb Pharm. The herbs used to prepare this compound are certified organically grown or they are sustainably wild crafted in their natural wild habitat. They are hand-harvested at their optimal potency, and are then promptly extracted while still fresh & succulent or after being carefully shade-dried. Helps maintain established, normal blood pressure. Expertly formulated with Hawthorn, Olive and other rapidly absorbed liquid herb extracts.